The latest Insider preview build of Windows 10 now gives desktop apps the ability to retrieve DPI/display scaling information from Windows without the need to log off the entire session and log back in. The latest Insider Preview build of the Windows 10 Fall Creators Update (Build 16237) has started rolling out to insiders in the Fast Ring and brings with it a gamut of much needed improvements. The most noteworthy of all is the ability for desktop apps to get DPI (dots per inch) or display scaling information from Windows without the need to log off and log back in. 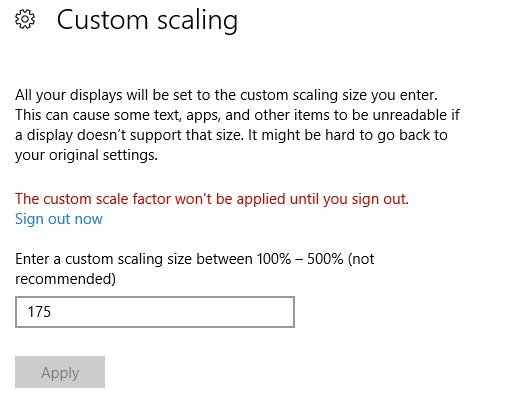 Desktop apps now just need to be closed and re-opened to respond to DPI changes as Windows now provides apps with scaling information every time they start. This was an oft-requested featured from users who use displays such as 4K panels, which have high DPIs or connect high density displays in a multi-monitor setup. Desktop apps that do not respond to DPI changes become blurry. Until now, users had to log off and log back in for desktop apps to recall DPI information from the Windows Shell. Now, in the latest Insider Preview build, Microsoft is enabling Windows to communicate the DPI information every time an app is started — in other words, one just needs to restart the app to make it DPI-aware. Many desktop apps are still not updated to reflect on-the-fly DPI changes and this feature should provide some respite to users of those apps. UWP apps, however, are fully DPI-aware and are immune to DPI scaling artefacts. 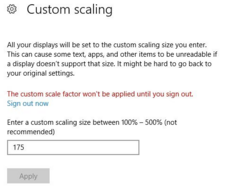 Along with improvements to DPI scaling, there are a few more features as well in this build. Microsoft Edge now gets the ability to read aloud all websites and PDFs. The build also includes UI improvements to the Action Centre, MyPeople, Emoji Panel, Touch Input Panel, and GPU tab in Task Manager. For a complete list of improvements, check out Dona Sarkar's post on the Windows Experience Blog. As always, this being an Insider build, it is best to refrain from installing it on a production machine or a daily driver.